The description of a real creature known as Behemoth given in the biblical book of Job, including its tail ‘like a cedar tree’, sounds remarkably like a sauropod dinosaur. Dinosaurs have hit the headlines recently with the finding of the partial remains of what may have been the largest dinosaur ever to tread the earth. Creationists believe that the dinosaurs show God’s marvellous creativity, so the larger the find, the more His power and majesty are revealed. Claims of finding larger and yet larger dinosaur specimens are not unexpected—they are the ones most likely to make the news and attract research funding.3 However, the existence of such large dinosaurs is not contrary to the expectations of creationists. We believe that the dinosaurs show God’s marvellous creativity, so the larger the find,4 the more His power and majesty are revealed. A matter of particular interest to creationists, apart from the fact that Noah’s Flood could have provided the material necessary to bury the eggs and the conditions to do this rapidly, is the size of the eggs. Even though the eggs housed embryos of the largest land animals ever, the coiled hatchlings would have been only about 38cm (15 inches) long. Thus there was no reason for Noah to have taken towering ‘grandfather-sized’ sauropods on board the Ark. Maturing juveniles would have easily fitted in the space available and then been able to help fulfil God’s purpose that the animals aboard would fill the earth after the Flood. Like many modern reptiles, dinosaurs may have kept growing until they died, so the very large ones may also have been very old. Note also, many dinosaurs were not large even when fully grown, e.g. the hen-sized Compsognathus and mouse-sized Mussaurus. In fact, all the dinosaur skeletons so far discovered indicate that the average size was that of a sheep. Dinosaurs are currently claiming the public’s attention for another reason. A new Disney blockbuster film called Dinosaur was released in May, 2000. It uses even more remarkable special effects than did its predecessors, such as the BBC series Walking with Dinosaurs and Hollywood’s Jurassic Park. However, it, too, is not fact but fiction. The plot concerns a young iguanodon named Aladar, who survives the asteroid impact which, according to a common belief among evolutionists, led to the extinction of the dinosaurs 65 million years ago. The film shows no humans, as they had ‘not yet evolved’. Aladar is adopted and raised by a group of kind-hearted lemurs (slender primates10 with monkey-like bodies), even though, according to evolutionists, primates did not appear on Earth until after the dinosaurs had become extinct. “We cheated by about 50 million years,” says film co-director Eric Leighton, because the filmmakers wanted to convey the idea that these lemurs (and hence humans as well) have an evolutionary ancestry that goes back to the dinosaurs.11 To this end, Aladar is mammalian in appearance. From the side, his head resembles the ‘Przewalski’s Horse’ from Mongolia. A recurring theme in Dinosaur is that survival depends on being compassionate and cooperative. Aladar’s compassion for the other dinosaurs brings him into conflict with Kron, the harsh leader of a herd of dinosaurs that survived the asteroid impact. This idea seems to fit with the belief of a growing number of ‘New Age’ evolutionists whose credo is that we are all part of ‘Nature’ and should all get along well. The film thus presents a sanitized New Age version of evolutionary dogma. In a press release [re the film Dinosaur] Disney publicists acknowledge that the film ‘intentionally veers from scientific fact in certain aspects’. In a press release, Disney publicists acknowledge that the film “intentionally veers from scientific fact in certain aspects”. Creationists welcome the authentic dinosaur facts uncovered by researchers, although not their usual evolutionary interpretation of these facts. And we are not fazed by the dinosaur fiction that emanates from Hollywood, the BBC, and the media. 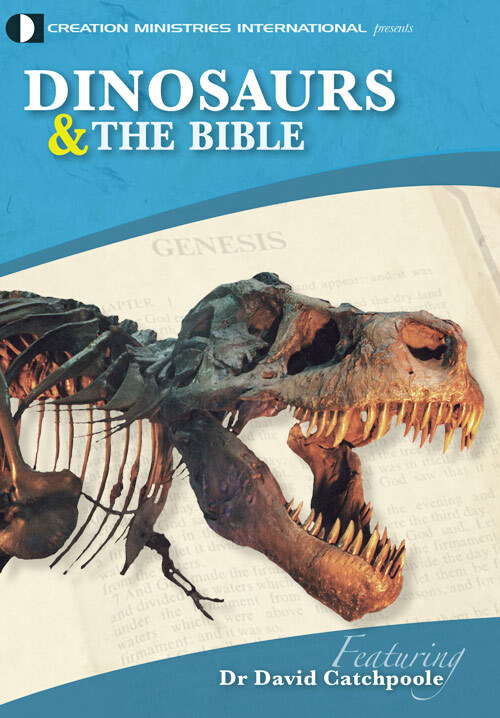 The Bible presents a time-line of history which explains the advent and extinction of the dinosaurs, consistent with the evidence, but totally contrary to evolutionary dogma. The dinosaurs were made on the sixth day of Creation Week, along with Man. There was no death, bloodshed, carnivory, or disease before Adam sinned. 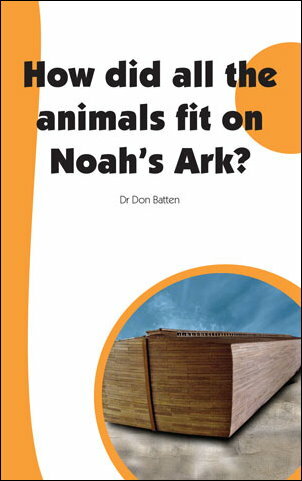 All the air-breathing land-animal kinds, including dinosaurs, were on the Ark of Noah. Even (young) sauropods could easily have fitted aboard. The dinosaurs gradually became extinct after the Flood. There is much evidence for the recent existence of some specimens of dinosaurs. For example, carvings and paintings of dinosaur-like creatures have been found in several parts of the world—evidence that man and dinosaur lived at the same time. Unfossilized dinosaur bones in Alaska12 and a T. rex leg bone containing red blood cells13 have been discovered. 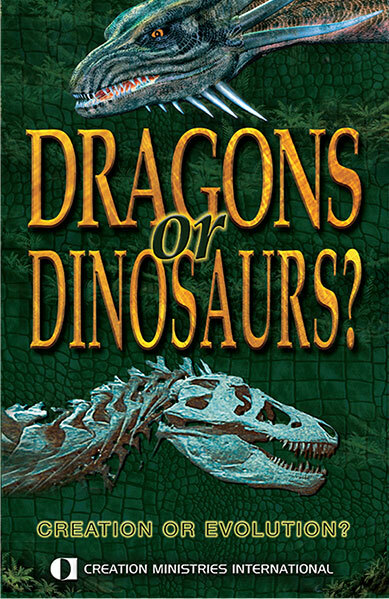 Many nations have stories of dragons, which fit very closely the descriptions of dinosaurs. Sauropods were the largest creatures known to have trodden the earth. They were the giant four-legged herbivorous (plant-eating) dinosaurs, with very long necks, small heads and brains, very long tails for counter-balancing their necks, and large guts for digesting the huge amounts of plant materials they ate. The term ‘sauropod’ means ‘lizard-footed’, and was chosen because they stood firmly on all four feet. The best known of all sauropods is Brontosaurus, even though ‘Bronty’ never existed! In the 1870s, Othniel Charles Marsh discovered some very large dinosaur fossils in Lake Como, Wyoming, USA, and thought that he had discovered a new genus. He gave them the name Brontosaurus or ‘thunder lizard’, because he thought that the ground must have thundered when such a huge animal walked by. Unfortunately the head was missing. To remedy this obvious deficiency, he added a skull found several kilometres away in a different quarry and in a different layer of strata, but told no one about this. In 1974, two scientists convinced the scientific community that the ‘Brontosaurus’ skeleton was really that of a previously named dinosaur, Apatosaurus, and that Marsh had used the wrong head, that of a different type of sauropod, like a Camarasaurus. Rather, the correct head was longer and less round, and almost identical to that of a Diplodocus. As the rules used for giving scientific names to animals state that the first name given is the one to be kept, the name Apatosaurus stayed and Brontosaurus was dropped. The creature is now classified in the family Diplodocidae together with Diplodocus. 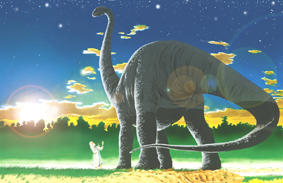 It is likely that all Diplodocidae are descended from a single created kind, where the created genetic information has been separated into different populations aided by natural selection, producing both Apatosaurus, a relatively short and massive variety, and the very long and slender Diplodocus. 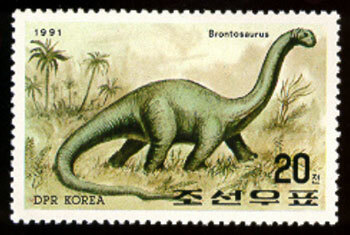 Surprisingly, the non-existent ‘Brontosaurus’ is depicted and named on several stamps, including a 1991 North Korean 20 won that shows a single creature, a 1989 United States 25c that shows a pair, and a Central African Republic 50F that shows a herd. Sauropods are favourites with movie producers. They are the first dinosaurs to come into full view in Jurassic Park, they appear in various roles in The Flintstones cartoon and movie, including as ‘Bronto burgers’, and they feature prominently in the BBC’s Walking with Dinosaurs and Disney’s Dinosaur. 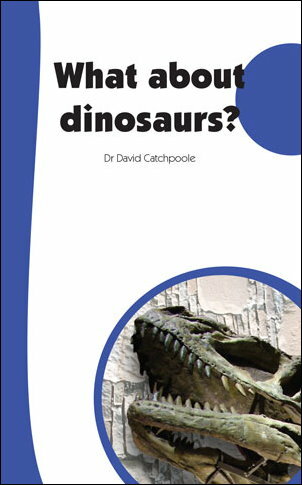 The Bible provides the best explanation, consistent with the evidence, to account for all the dinosaurs, including the sauropods. Christians can use this information with confidence to witness to their faith. <http://www.abcnews.go.com/sections/science/ DailyNews/dinosaur_patagonia000125.html> May 25, 2000. Return to text. 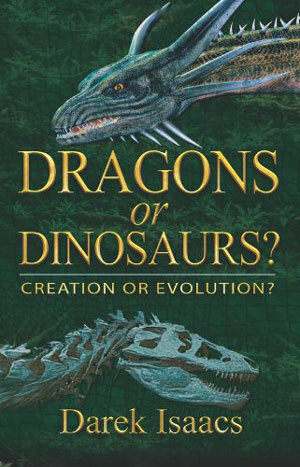 <http://www.abcnews.go.com/sections/science/DailyNews/dinosaur_000120.html> May 25, 2000. Return to text. In 1994, in southeastern Oklahoma, USA, scientists unearthed four vertebrae, the largest of which was “140 cm long—suggesting a neck length of 10 meters and a body running 30 meters from head to tail”. See Science 286(5443):1285, November 12, 1999. The team currently in Argentina has now claimed a longer body from a significantly shorter vertebra. Return to text. Or, for that matter, the smaller the micro-organism. Return to text. Chiappe, L. et al., Sauropod dinosaur embryos from the late Cretaceous of Patagonia, Nature 396(6708):258–61, November 19, 1998. Return to text. They are the first sauropod embryos in the world to be identified, the first dinosaur embryos to be found with fossilized skin, and the first dinosaur embryos to be found in the Southern Hemisphere. Return to text. Charig, A., A New look at the Dinosaurs, Rigby Publishers, Adelaide, Australia, p. 114, 1985. Return to text. 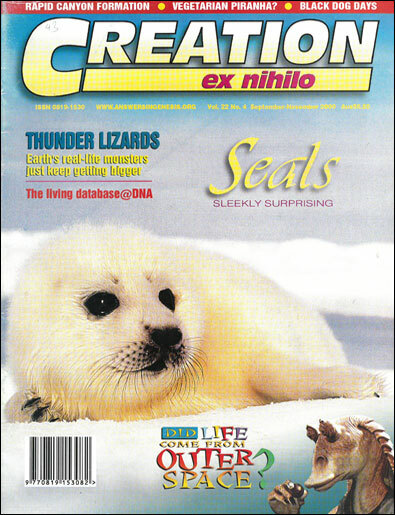 canoe.com/CNEWSScienceArchive/981117_dinosaurs, May 25, 2000. Return to text. Chiappe, L., Dinosaur Embryos: Unscrambling the Past in Patagonia, National Geographic 194(6):34–41, December 1998. Return to text. The order of mammals that includes man, apes, monkeys and prosimians. Return to text. Leighton candidly admitted, “[W]e’d cheat like h-ll! We’re not making a documentary; we’re telling a story.” Source: USA Weekend, May 12–14, 2000, p. 7. Return to text. Davis, B. et al., The Great Alaskan Dinosaur Adventure, Master Books, AR, USA, 1998. Return to text. Wieland, C., Sensational dinosaur blood report, Creation 19(4):42–43, 1997. Return to text.